Can you post the website url where the form is added so that we can do further check. The form is not updated when previewing the EMBED code in JOT Form site. But with other embed format it is updated. 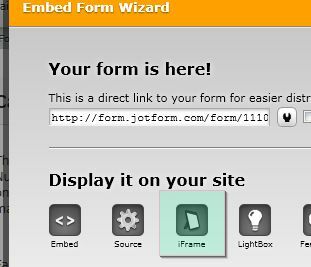 If i am not mistaken, embedded form has been successfully updated but actual form on JotForm has not been updated yet. Is that correct? Can you please clear your browser's cache and login to your JotForm account again? It would be also very helpful if you can provide us the URL of your website. Yes, its work now after deleting the temp files. May I ask you for a question please. How to compact the form to save size in my website? Length wise. You can also embed the form using iframe so that you can edit the width and height properties. To do this, just click on embed form, click iframe, copy the source and paste in on your webpage. From there you can change the form properties to your preference. Appreciating very much for your great support.